Every 55places.com community expert is hand-selected from the top percentage of real estate agents nationwide. They will help you find the perfect home in your ideal community. Jennifer Savage is an outstanding person. She has gone out of her way to assist us on several occasions. Jennifer called and emailed if necessary to keep us informed at every step of the way. We are grateful to have her as our agent. Excellent in every way possible. My experience working with Wendy could not have been better. Living out of state was not an issue. She set up a portal so I could see daily what was available in the communities. She is a thorough, knowledgeable all around person who listens to your needs and truly understands your wants. We keep in contact to date. Drew went above and beyond the basic requirements of my chosen Real Estate Professional. I enjoyed working with him over a decent period of time. He was patient, adjusted his approach based on my feedback, was always extremely responsive, insightful...need I continue? You would do well to have Drew in your corner! I have bought/sold a lot of real estate through the years. Lila is the finest agent I have ever dealt with. She is honest, professional, intelligent, responsive, and a pleasure to deal with. I recommend her highly. I contacted Tim after viewing 55+ communities. He showed us everything we wanted to see and more. Tim is extremely knowledgeable about the area and communities we were not aware of. He showed us everything on our wish list. We are now owners in Myrtle Beach and are living the dream. The #1 resource for information about active adult communities in the United States. 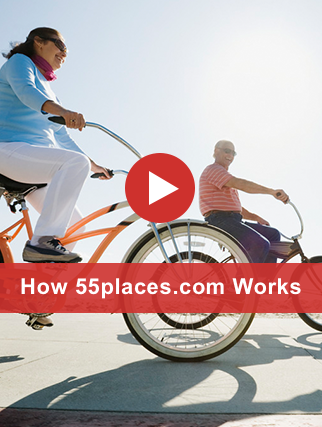 55places.com – The only site you will ever need to find the perfect place to retire. Search from thousands of 55+ active adult communities and active retirement communities in the U.S. This site is designed for active adults who want to search the best communities to find the ideal new home.